There’s something about lavender that I find so lovely. The color, the smell, the floral flavor … it is absolutely my favorite across the board. When I was 12, I painted my room the color of lavender and it stayed that way until I left for college. Throughout my teens and twenties, I dabbled further with diffused oils, hygienic concoctions, teas and gardens. Even our wedding cake was baked with lavender flakes sprinkled into the batter. Through the ages, in some way or another, lavender has completely infiltrated my life and sort of become a theme of mine. For my 29th birthday, I had the choice to spend the day anyway I pleased and following suit, I couldn’t think of anything I wanted more than to run through fields of lavender. Which brings me to my newest obsession I want to share – Hood River Valley, OR. This little pocket of the world is quite possibly the dreamiest place we’ve discovered since moving to Oregon. So dreamy, in fact, that Brad & I spend weekends venturing out, driving through, and dreaming of any and all possible ways to migrate, build, and sustain a life here. Let me paint a picture for you: envision for me (or just click the link above) misty lush green rolling hills, big tall evergreen pines, fields of farms with rivers running through fertilizing the land, and mountains encompassing in every direction. Now, envision this heavenly little pocket resting perfectly between the Columbia Gorge and Mt. Hood. In one direction you have water sports and a river cut canyon, and in the other you have mountain sports, like hiking, biking, and snowboarding. And the best part - From an elevated perspective, you can literally see the earth emerge from sea level to a height of 11,000+ ft. in one single, dramatic view. The wide flowing Columbia River radically transitions to the cliffs of the gorge, which plateau to rolling fields of farms, gradually growing in size into mountains that grow even bigger and eventually peak to the tip of Mt. Hood. Close your eyes, can you see it? This lovely little valley is about an hour’s drive from Portland so more often than not, Brad & I find our weekend adventures drawing us in this direction. Orchards, wineries, art galleries, tulip fields – you name it, Hood Valley’s got it. 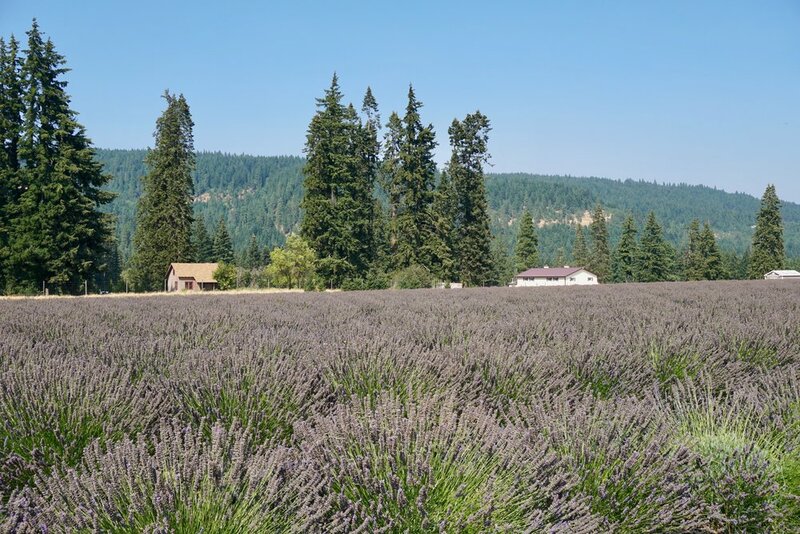 Lavender Valley, a sweet little spot manifested from a dream of a mother and her son, is nestled in the misty mountains of Hood River Valley with Mt. Hood forming a perfect backdrop. The reality of Oregon summers sometimes involves smoky days from nearby wildfires, so unfortunately for us we could only barely see the Hood from the fields. I was told June is the best time to experience the abundance the fields and view have to offer, so looks like we will be going back for Brad’s birthday - ha! As happy as a field full of lavender can make me, I wasn’t prepared for the feeling of elation upon – quite literally – running through the fields of lavender. Because Oregon holds such a special place in my heart, and Hood Valley encapsulates so much of what makes it so special, and here I was with my hubby and my puppy on my 29th birthday, and I mean seriously – Does life get better? Maybe one day we will build a cabin, maybe one day we will be full time residents, maybe one day this will all be a distant memory. Whatever the future holds, today I am grateful because my heart knows moments like these. Wherever we end up, whatever may come to be, I will always remember lavender fields forever.